Despite blasting federal overreach in education and making other statements sure to delight conservatives and constitutionalists, U.S. Education Secretary Betsy DeVos continued to mislead Americans on Common Core last week. Indeed, despite the dumbed-down national standards still being in place in almost every state, DeVos falsely claimed that Common Core was “dead” at the Department of Education. In yet another address that at least superficially put forward sound statements reflecting the Constitution’s lack of mention of any federal role in education, DeVos has again failed to convince the base of her party that she actually believes this fact. Where the Bush administration emphasized NCLB’s stick, the Obama administration focused on carrots. They recognized that states would not be able to legitimately meet the NCLB’s strict standards. Secretary Duncan testified that 82 percent of the nation’s schools would likely fail to meet the law’s requirements — thus subjecting them to crippling sanctions. The Obama administration dangled billions of dollars through the “Race to the Top” competition, and the grant-making process not so subtly encouraged states to adopt the Common Core State Standards. With a price tag of nearly four and a half billion dollars, it was billed as the “largest-ever federal investment in school reform.” Later, the Department would give states a waiver from NCLB’s requirements so long as they adopted the Obama administration’s preferred policies — essentially making law while Congress negotiated the reauthorization of ESEA. Sure, the U.S. Department of Education is not actively pushing Common Core, they don’t need to. The standards and assessment consortiums don’t need to be funded anymore. The damage is done. They don’t need to publicly push it because ESSA essentially codified Common Core. At best, DeVos’s views on Common Core are murky, and conservatives have never been sold on her statement that she has “always agreed” with Trump that Common Core is a “disaster.” In fact, DeVos never was a fan of Trump and actually served as an at-large delegate of Common Core supporter John Kasich at the GOP convention in 2016. “The Every Student Succeeds Act, which is in the process of being implemented now, essentially does away with the whole argument about Common Core,” she added. DeVos’s pronouncements that Common Core is “dead” seem disconnected from reality to parents across the country. Education Week reported, “at least 37 states” are still using the Common Core standards or its “rebrands” – renaming the Core with a state-friendly title – as of the end of 2016. Meanwhile, Education Dive notes Timothy Shanahan, a professor emeritus at the University of Illinois at Chicago – and one of the authors of the Core, says the standards are still in effect in 42 states. “Even if Common Core were ripped out from the roots, the federally controlled government ‘education’ system in America would continue to dumb down and indoctrinate students on an industrial scale—literally threatening the future of the nation,” Newman writes. In dulcet conservative tones, DeVos also announced during her AEI address that federal mandates are not working to improve education. The thousands of parents fighting against Common Core in their states for years now have been saying that to establishment Republican and Democratic lawmakers – but to no avail. DeVos herself, however, continues to plug ESSA – a federal mandate. Vander Hart asserts DeVos should heed her own advice. A big part of conservatives’ problem with DeVos is the fact that she has invited many followers of her close friend Jeb Bush to advise her. Bush has been a primary supporter of Common Core and school choice. 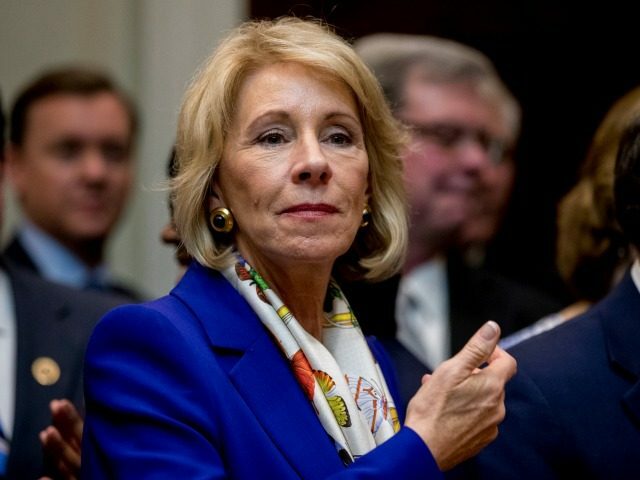 Robbins and McGroarty observe that while DeVos has declared Common Core “dead,” she has followed Bush’s lead in the areas of school choice – without detailing the mechanisms for bringing about the “choice,” and “digital” or “personalized” learning – which is a major platform for student data collection. [S]o-called personalized learning is actually depersonalized, computerized training rather than genuine education. It replaces a liberal arts education with pared-down workforce-development training that concentrates on “skills” corporations deem necessary for the (current) job market. It props children in front of computer screens that feed them curricula (probably not available for parental review) that children can click through without really learning anything. It indoctrinates children with government-approved attitudes, mindsets, and beliefs. It collects literally millions of data points on children that will allow the government and vendors to create profiles and algorithms that may control each child’s future life path. It minimizes human interaction, converting professional educators into data clerks. Of course, ESSA is fully on board with digital learning and DeVos is fully on board with ESSA. Constitutionalists note that until DeVos can put into action the words she apparently believes make sense to Trump’s constituents, she will continue to have battles with both the left and the conservative wing of her own party.